However, Mitchell Godkin has experienced a wonderful synchronicity of skill sets that developed into an opportunity to create a new kind of baseball bat that in his testing so far, offers more strength and flex than traditional bats. The discovery came about via wood drying using a kiln process entrepreneur Mitchell Godkin is keeping under wraps as he promotes his new business, Leadbury Bats Co. outside of Walton. Over 300 people were able to see everything but the kiln during an open house Godkin recently co-hosted for his manufacturing facility which is located on the Godkin family farm. His parents, Bruce and Katrin Godkin, operate Nostalgic Wood while his brother, Lucas, creates custom wood furniture. Each family member was part of the Open House. Godkin was also a panel member in the Reskilling for the 21st Century plenary session at the Rural Talks to Rural (R2R) Conference held in Blyth recently. He’s a confident, articulate young man with a host of skill sets that have resulted in a cool, new business that he hopes will one day employ a handful of staff and produce 15,000 bats a year. Mitchell was focussed on a career in motocross when his parents launched Nostalgic Wood in 2013. “I wasn’t thinking about wood at all,” he laughs. However, that summer his parents encouraged him to take on the project of learning how to operate their new “speciality kiln”, one of only a handful in North America. It came with very basic instructions. The next summer, Mitchell worked with a local logging company that was developing a new revenue stream manufacturing baseball bat billets. The company wanted to contract the Godkins to dry the billets. Sensing an opportunity, Mitchell dried the billets and discovered the new kiln could dry wood faster, more evenly while maintaining the integrity of the wood grain. “The conventional method of drying is to dry from the outside in,” explained Mitchell. However, by the time the billet is dry on the inside, the outside is too dry. This can cause cracking. The new process Mitchell is using reduces stress on the wood by drying wood evenly throughout the billets. “The end result is a bat with more strength, increased flex and superior fracture mechanics,” believes Mitchell. Mitchell hired a Mennonite shop to transform the billets into his first baseball bats. Testing in the General Dynamics Lab at Western Engineering revealed his 33-inch 271 Leadbury bat showed 20 per cent more strength and 30 per cent more flex than a Louisville Slugger model. That’s when synchronicity hit. Mitchell could combine his engineering knowledge to create a better bat using his family’s manufacturing tools to become a baseball bat entrepreneur. He transformed a shed on his parents’ property to a manufacturing facility and adopted the name Leadbury after a nearby hamlet. His motto is “Engineered to Outperform”. Mitchell asked the Western Mustangs baseball team to use the bats as well as London Majors outfielder Byron Reichstein. 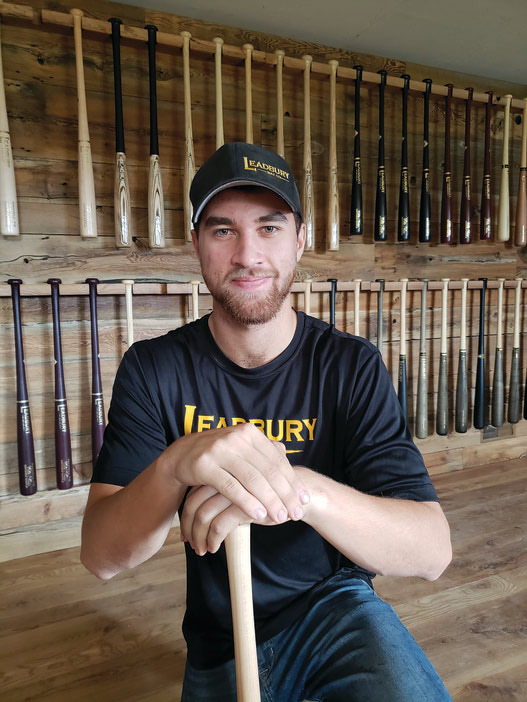 Leichstein has indicated he will use Leadbury bats full-time because he loves the feel of it. Leichstein and Mitchell spent a full day together this summer refining handle design, knob styles and balance. Currently, Mitchell is producing five models of bats in a series of black, grey, burgundy and natural colours. All the staining and stickers are applied by him. Mitchell plans to offer custom names and colours to teams as a selling point. It takes about one hour to make one bat out of a dried billet using the new, programmable lathe that was installed this summer. Right now, he is focussing on the actual wood of the bats. Mid-November to the new year is the prime season for harvesting wood. In spring and summer, the wood is too sappy. Also, summer wood has a tendency to keep the bark while bark falls off winter wood. Mitchell handpicks each piece of wood that comes in for his bats. This is what gives his bats extra quality. Also, he is finishing his thesis on the micro structures of woods and the new drying process. He will need to return for his fourth year but is currently on an “engineering internship”, a special allowance given to him by Western to encourage his kiln-drying discovery and entrepreneurial bat business. Website development is next on the agenda and Mitchell has hired the talent of his cousin to help him in this area. The manufacturing process has to be fully in place to be ready for the results of a marketing campaign. Leadbury bats range in price from $105 to $160. Mitchell can produce 100 bats a week and his long-term goal is to supply the Ontario market with a production goal of 15,000 bats per year. Is supplying major league players on his projection sheets?